Our second Volunteer of the Month is Graham Black, our Official Photographer, courtesy of the Star & Garter. 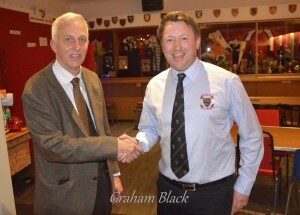 Graham has been nominated by Helen Morrison for his tireless efforts at the club. As Helen says “he is at every First XV game if not more. He has come to every event requested and taken the photos. He spends a lot of time at home the sorting and editing the shots he takes. He then downloads them every week in a timely fashion. He has donated money he has made out of any rugby shots to the club. His photos have brought stories to life, secured press coverage, drawn the attention of members and the local community”. Graham is for once in front of the camera, being enthusiastically congratulated by our Club Development Officer Dougie Thompson. Many thanks Graham.